What would it be like if more than two dozen different wild animals from around the world got together to boast about their senses? David Bouchard delivers a unique explo...ration of the realm of the senses in 25 animal portraits. 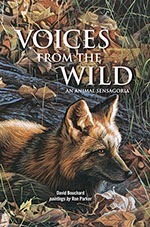 In warm, lyrical verse, Bouchard introduces the reader to some fascinating aspects of natural history and explores each sense—sight, smell, touch, hearing, and taste—through the voices of such captivating animals as the eagle, orca, wildebeest, cougar, elephant, moose, koala, and wolf. Enhancing Bouchard's whimsical poetry are the wildlife paintings of noted British Columbia artist Ron Parker. In fact, it is the artist whom the various animals try to impress with their respective senses, whether it is the grizzly's lofty claims for best smell, the penguin's gentle declaration of superior vision, or the gorilla's confident assertion of closeness to humans in all senses. David Bouchard's vivid poetry and Ron Parker's wonderful artwork breathe life into this endearing menagerie, reminding us of how precious our wildlife is. Together, artist and poet have created a heartfelt portrayal of the age-old relationship between humans and animals, one that young and old alike will remember and cherish. An acclaimed author of children's books, David Bouchard is also a champion of literacy. This former teacher and school principal has written more than 50 books. He is a member of the Order of Canada. Ron Parker is recognized as one of the top wildlife artists in North America. He has had many successful shows in Canada and the United States. He spends many hours hiking and photographing in such diverse places as the Northwest Territories, Kenya, Costa Rica and the Rocky Mountains, gathering firsthand knowledge of his subjects and their environment. He lives on Vancouver Island, British Columbia.